Matonis also noted the increasing adoption of XBT into Forex trading, which he expects to be a game-changing development for bitcoin. One major Forex dealer, OANDA, currently quotes XBT rates in other currencies but does not offer it for trade. Likewise, XE.com, a popular foreign exchange rates website, has recently begun to quote bitcoin rates– though it offers no trading itself– which undoubtedly has been catching the eyes of a number of Forex traders. Currently, only AvaTrade, BTC-E, and Bit4X currently have begun to trade bitcoin on Metatrader 4, a popular Forex trading platform. As Bitpay reported this week on the phenomenal growth of in new merchants this year, a number of new services might connect Bitcoin to retailers and other businesses and services which may not yet accept it. Already services like Pizzaforcoins.com attempt to offer a virtual shopping experience with bitcoin. Having only Pizza as an option is a bit of a gimmick, since in fact the service could just as easily extend to any food delivery. An exchange might add a type of exchange and pay service on the consumer end rather than on the merchant’s side, or an entirely new service could act as an intermediary, much like Paypal. The popularity of charge-backs and disputes at Paypal might ostensibly be part of the reasoning in the continuing reluctance to accept bitcoin, as transactions are irrevocable. However, that just leaves the door open for a competing service to sprout up. In trading Wednesday, Bitcoin traded slightly higher at Mt. Gox, where it remained above $140 after hitting a high of $142. 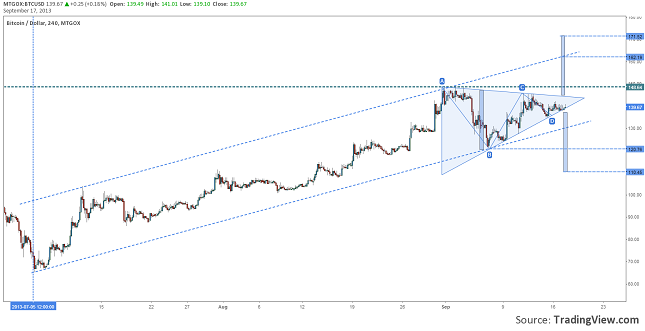 For a technical analysis perspective today, Investazor.com investigates a symmetric triangle pattern developing in bitcoin prices. (See chart below).